A quick dinner using up left-over chicken breasts. Even fussy eaters like this one and I would know as I am married to Mr. SuchAFuss, worlds fussiest eater. In a large mixing bowl pour in the undrained can of black beans. Use a potato masher and mash up the beans. Add the salsa and give it another mash. Heat a large skillet and pour in the quinoa. Toast the quinoa for about 5 minutes. Pour bean mixture over the quinoa add the corn and chopped cooked chicken. Mix well, cover and reduce heat. You want to give the quinoa time to absorb the liquid from the beans and salsa. 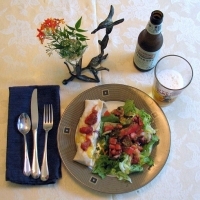 Wrap the tortillas in a clean dish towel. Dribble a bit of water on top of the towel and heat in microwave for about 1 minute to soften the tortillas. Shred the cheddar cheese and place a small amount in the on the tortilla. Maybe 1 tbsp to each. Preheat oven to 375, spray a glass baking pan with PAM. Divide the bean and chicken mixture on each tortilla. Roll up burrito style and put in the pan. Sprinkle remaining shredded cheese on top and put in oven to brown the cheese, maybe 15 minutes. This is *perfect* for me. I eat so much chicken. I'll probably swap out the cheese for something lower fat, and go with a wholegrain tortilla or lavash bread. Thanks! Looks like something we would love! On my list to try.